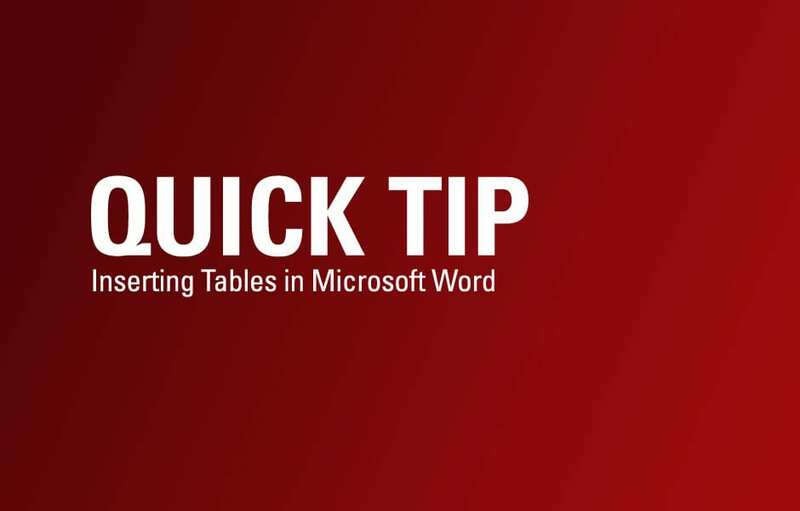 Quick Tip: Inserting Tables in Microsoft Word . Tables are extremely useful in documents of all types, but they can frequently be confusing when you want to modify them to get a specific effect. We’ll show you two ways to insert a table. In another tip, we’ll show you where and how to modify border thickness and color, background colors, and more. Tables are made up of cells (“boxes”). Cells are organized vertically into columns and horizontally into rows. When you insert a table, you’ll need to know how many rows you want and how many columns. To quickly add a table, place your cursor in a Word document where you want to the table to be. Then, go to the Insert tab on the Ribbon. Under Insert, in the Tables group, click the Table button. A drop-down menu will appear, and at the top of the menu will be a grid of cells. If you hover and move your cursor over this grid, you’ll see a preview of a table in your document. After moving your cursor around and finding the table size you want, click on the grid. If you find that the quick insert method is too confusing, you can manually choose rows and columns by going to Insert > Table on the Ribbon, and then clicking Insert Table on the drop-down menu (directly under the grid). In the dialog box that appears, select the number of columns and rows you want, and then click OK. The table will appear in the document. IT Solutions wants to help make you for efficient at work. To receive monthly quick tips such as this, sign up for our free newsletter here.